And he has never written a book—until now. 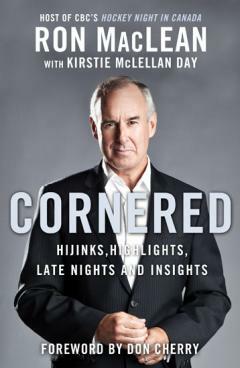 Cornered is packed with inside accounts—some inspiring, many hilarious—from his early days as a part-time radio announcer and weather forecaster in Red Deer, Alberta, to his time hosting Hockey Night in Canada and the Olympics. Perhaps no other journalist has witnessed first-hand more Canadian sports milestones in the past quarter century. From Gretzky to Catriona, Mario to Salé and Pelletier, MacLean has been there with an eye for detail and an appreciation for what makes a great story.